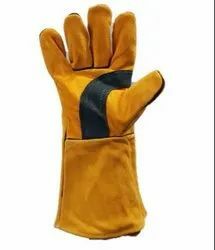 Leading Manufacturer of welding gloves from Chennai. We are offering Heavy Duty Leather Welding Gloves to our clients. Made of premium quality natural leather for heavy duty welding and material handling purpose. Comfortable to work and sweat absorber lining inside gloves. Hemming at the end of cuff to avoid itch. Long life in comparison to other gloves.